Finally after 2 years of trying off an on I grabbed a decent sound clip of a too-geh squawking outside the room. When I first got to Thailand I heard the LOUDEST too-geh ever. King too-geh. It is located at Green Garden Bungalows in Patong Beach on the North end of the beach – up around the Amari hotel I think it’s called. The thing is massive. Thais’ say “too-geh” but I found it spelled online as “Tokay”. And the scientific name is supposedly Gekko Gecko. The first time I saw it I was standing outside talking to my friend. It was dark out and I could see this shape above his head on the wall – and I thought, holy hell – that’s a big plastic lizard… why did they put it up there? We talked for about 30 minutes and then the thing MOVED! I almost fell over as it was only 2 feet above his head. I almost hit the ground when it moved because in my mind it was plastic – nothing to worry about. This too-geh was about 18 inches long (with tail). It was fat, very well-fed. How it could stick to the wall when it must have weighed the better part of a kilogram I have no idea. That night when I heard it for the first time outside my window I froze in bed wondering – WHAT THE F*$*$@ is that? I thought it was someone playing a joke on me. The first part of the squawk sounds like a growl – like it’s getting pizzed off. The second part is comical – like a little kid making a funny noise. This clip is not of the monster in Patong, but this one is fairly loud and clear. I’m in search of the perfect sound clip so if you’re able to grab one with your mobile phone and you send it to me I’ll PayPal you a few dollars or give you a free plug on Thaipulse or something. Wow, that’s actually the “Global Gecko Association”! These guys are serious about their geckos. The sound quality on some of those are excellent too. Ok, I rescind my offer of a few bucks or plug for your business since I found an awesome too-geh clip on that site. I’m fascinated by weird animals that I know nothing about – as if I had to tell you! I’ll bet 10% of my 180 posts are about Thailand’s wildlife! I gotta keep posting this stuff as I get it. I have just recently come back from thailand where we stayed in a treehouse for one night near khon kaen. In the evening while we were there I turned around to see a huge lizard on the wallm we had to get someone to come and get it out as we were aware that they bite and were told that it was a cupcae lizard (thai name maybe) as that is the noise that they make. The same noise as the clip above. You stayed in a TREEHOUSE? I’ve only heard of one other person doing that – can you tell us the name of the place? I am living in Pai Thailand and have a 6 month rental on a Teak house here. We often heard the sound of a Tokay close to the house, and often late at night, IN my bedroom. I found a Tokay mating call on the internet and began playing it for a couple of nights, and then I stopped and sat quietly on the porch with my friend. We felt certain that last night we would see the source of the sound. As we watched a small gecko on the porches rattan catching bugs when a larger Gecko caught our attention, we watched the larger gecko put on spectaular show featuring amazing and quick camoflages. We really enjoyed his pre his performance…. I think the Tokay was jealous as if to say you think that is something, Get a look at me. We heard his loud call. We looked to its location and saw what appeared to be a large mans sock on the wall. I told my friend I thought it might be the Gecko, she said preposterous it is something else, but then it moved at the speed of light. We watched the spot where the large white thing had been when I noticed what appeared to be a large leaf hanging down. It was the lizards head. It went back into a slot in the wood fast as lightening, and then it slowly appeared and little my little, almost like not moving at all, it raised its head looking like a cobra and glared right at me with a demons eyes and diamond shaped face. After a few moments he disappeared again making a sound as he turned and showed us a very primitive, thick and impressive physique. disappearing again then, after a few moments looked out to see the reaction. I want to be friends with the gecko, no more playing of male mating calls since I don’t want to confuse the poor dear. Anyway wish me luck and let me know if anyone else has become buddies with his Tokay neighbors. is that the actual color of the lizard? it looks really cool! 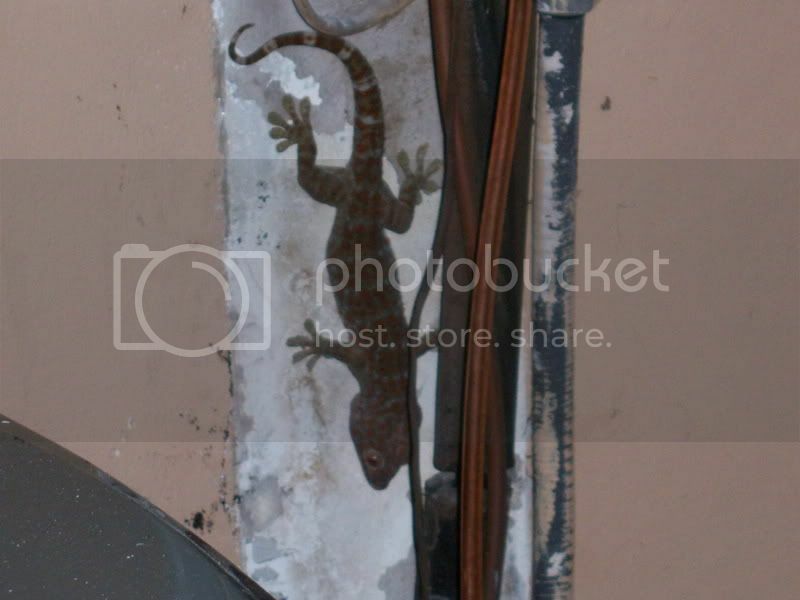 I bought an 80 year old house in Clearwater, Fl 8 years ago and it was crawling with these beautiful geckos. The first thing the neighbors did was come over and teach us about them. Apparently the original owner imported them as a natural form of pest control. They mated and live all over our block now. Every night for the past eight years we hear the beautiful sounds of the geckos calling each other. When we renovated, we found their eggs attached to the joists in the walls. We have noticed that they can always be found at the same place at the same time every night. At 9pm they zig across my sons window. At 11 pm they zoom through the attic. We just love them and they have never been any trouble to us. We have two dogs who have never been bothered either. I can’t imagine hating them or needing to kill them. Our house guests are always blown away when the sounds of the geckos start at dusk. They call each other throughout the neighborhood like old friends sounding the bell for play time. They are a true wonder. YOU HAVE NO IDEA HOW HAPPY WE WERE TO FIND YOUR BLOG! We’ve had this loud, annoying and mysterious sound emitting from the back of our house for 5+ years. We nicknamed it “The Frog” as that’s kinda what it sounded like. After spending close to a grand over the years in A/C repairs (as we thought it was coming from the drain pipes), we learned late last night that it was a giant gecko known as a Tokay. It was in the cover that protects the A/C’s drain pipes, so we weren’t that far off. PRO: We’ve never had roaches. CON: This thing can eat SMALL BIRDS! AHHHHH! I should get a sound clip to you. Ah, the pleasures of living in South Florida. Well, especially with a new baby, we have to get rid of this thing. We got a new drain pipe cover and had it sealed on either end. It didn’t work. I guess that we are going to have to rally a posse and take it down! I HATE this thing! Wish us luck!